Berrylicious plant superfoods combine for a comprehensive and antioxidant rich formulation to fight cellular free radical damage, immune suppression, support cardiovascular health and prevent the effects of rapid ageing. Rich in phytochemicals such as anthocyanin, flavonoids, vitamins and minerals for healthy cell formation and reducing stored fats. 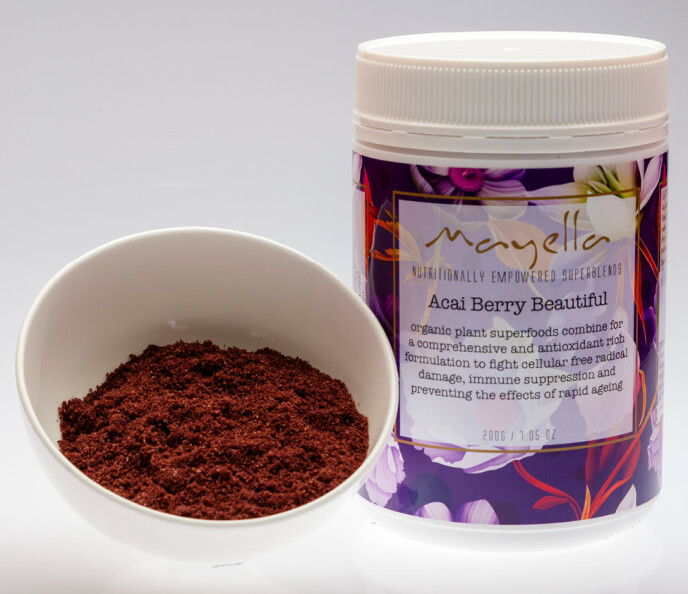 Specially formulated for optimal nutrition with organic superfoods, Mayella ® Acai Berry Beautiful is a natural whole food daily nutritional source that is suitable for all the family to enjoy. Our superfoods power blend makes seasonal fruits available daily in a delicious berry crumble, highly recommended for women, men, teens and children. A key ingredient of our Berry Nutritional Blend, Acai (pronounced Ah-sigh-ee), is only found high on top of palm trees in the Amazon rainforest of South America. This delicious berry has a balanced nutritional profile of omega 3, 6, 9 essential fatty acids (these the good fatty acids we need for energy, our nervous system and general health), amino acids, anthocyanins and a fabulous concentration of antioxidants with an extremely high ORAC value. Anthocyanins are complexes with the quality of being neuroprotective and anti-inflammatory. With current research showing their value in aiding diabetes, neurolgical diseases, bacterial infection, anti-ageing and anti-cancer benefits. Goji berries are an ancient food enjoyed in Asian cultures for many centuries. Goji and acai berries are renown for their connection with boosting Qi energy – our life force in Chinese medicine. Said to support the Liver, Kidneys and as a blood tonic, goji berries are also rich in antioxidants, particularly carotenoids such as beta-carotene and zeaxanthin. Acai and goji berries combined with all the superfruit berries in Mayella ® Acai Berry Beautiful truly reinforce the message that great things come in little packages. Low in calories but high in Vitamin C and fibre, the berries in our Mayella ® Acai Berry Beautiful are small but power packed with nutritional goodness. Our native to Australia superfruit, the Kakadu Plum, has been for centuries a food of the Indigenous Aboriginal Peoples and the traditionally eaten medicine to overcome sickness, wounds and skin disorders. Free radicals are harmful by-products produced by the body in response to high stress levels, diets low in nutrition and environmental factors such as radiation, air conditioning and pollution. These factors all play a role in the free radical damage we may each be experiencing in our busy lives. Eating a diet rich in antioxidants may prevent rapid ageing and the disease process by neutralizing and balancing the effect an overload of free radicals will have on our system. With a daily dose of Mayella ® Acai Berry Beautiful plant based nutritional blend, it is not only easy to access a premium source of antioxidants, it is delicious! Acai berries, blueberries, raspberries, Kakadu plum, goji berries, cranberries combine to provide a super antioxidant profile. The natural flavour, sweetness and valuable soluble fibre are derived from mango and beetroot creating a powerful superblend that is packed full of nutrition, phytochemicals such as anthocyanins, flavonoids, minerals and vitamins needed for healthy immune, cardiovascular, digestive and nervous systems while promoting bright eyes, glowing skin and strong connective tissue. Nothing will be easier for little ones or particular eaters to enjoy a teaspoon of Mayella ® Acai Berry Beautiful added to a glass of milk of choice – soy, cow, almond, rice, oat, coconut, stir and drink as a super delicious berry milkshake. See other recipe suggestions under Directions, subscribe to our e-newsletters, read our blogs and follow us on social media Instagram, Facebook, Pintrest to see other recipes and healthy tips and updates. A daily nutritional source of natural bio-available soluble fibre, vitamins, minerals, phytonutrients, essential fatty acids complex amino acids and enzymes for a building block towards greater health, wellbeing and longevity. As a daily nutritional source, mix 1 – 2 teaspoons of Mayella ® Acai Berry Beautiful into a tall glass of filtered water, natural coconut water, your favourite fruit or vegetable juice. Sprinkle over your breakfast oats, yoghurt, fruits such as papaya, rockmelon or cereal. Alternatively, our antiox Berry Super Blend can be added to your favourite smoothie or protein shake as an additional berry taste and nutritional boost. Store in a cool dry place, below 30°C / 86°F. Empowered smoothies and other antioxidant rich recipe ideas are available on our blog or free to download e-books. 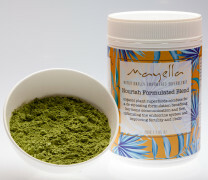 Seasonal superfoods combine for nutritionally empowered superblends now available all year round in Mayella ® Berry Beautiful. Ethically sourced and formulated with love in Australia. Amazonian Acai Berry* – A high concentration of antioxidants, particularly anthocyanins which help to increase your antioxidant levels to build immunity, aid in neutralising damaging free radicals and prevent oxidation of cells, glands and other molecules. In addition, anthocyanins, are excellent for heart health by naturally keeping your cardiovascular system healthy and preventing the oxidation of cholesterol. Fibre found in acai berry skin offers further cardiovascular support while aiding digestion and promoting a healthy digestive system. 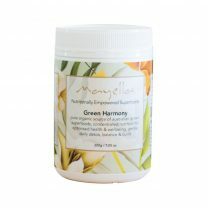 Naturally high in essential fatty acids that play a vital role in overall heart health and a healthy nervous system. Acai berries contain amino acids which help promote muscle performance, energy production, endurance and strength. Acai berries contain high amounts of Vitamin C and is also a source of Vitamins A, B1, B2, B3 and E with a rich mineral content particularly calcium, magnesium, zinc and copper. Kakadu Plum – A powerful antioxidant with the worlds highest known source of natural bioavailable Vitamin C. The Kakadu Plum, native to Australia, contains phytochemicals such as gallic and ellagic acids. Gallic acid has antibacterial, antiviral and antifungal activities and also shows anti-inﬂammatory, anti-tumour, anti-mutagenic and anti- bronchodilatory activities. Ellagic acid has anti-carcinogenic effects against a wide range of carcinogens in many human tissues. Eaten traditionally by the Indigenous Australian Aboriginal Peoples, Gubinge or Kakadu Plum is highly thought of more as medicine as well as food. For centuries the traditionally eaten medicine to overcome sickness, wounds and skin disorders. Mango – Research has shown antioxidant compounds including quercetin, isoquercitrin, astragalin, fisetin, gallic acid and methylgallat, as well as an abundance of other enzymes, vitamins and minerals in mango have been found to protect against various types of cancers. The high levels of fibre, pectin and vitamin C help to lower serum cholesterol levels, specifically LDL (bad). The tartaric acid, malic acid, and a trace of citric acid found in mango contribute to maintaining the alkali reserve of the body. Mangos contain beta-carotene, which is converted by your body to vitamin A and in conjunction with vitamin C is crucial to skin self-repair and eye health. Blueberry – Antioxidant and proantocyanidins rich to fight the effects of ageing by reversing cellular damage from toxins and free radicals while helping defend itself against dangerous pathogens. Contain high amounts of phenols, in particular gallic acid, commonly known as ‘neuro protective agents’ which means that they can literally protect our brains from degeneration, neurotoxicity and oxidative stress. Research and clinical studies show anticancer effects helping to eliminate cancer without damaging healthy cells. Supports healthy digestion, promotes good bacteria in the colon and significantly decreases the risk of various heart conditions. The wide spectrum of vitamins and minerals help restore hormone balance, which counteracts acne. Also, blueberries contain resveratrol which has been proven to reduce damage from over-sun exposure and can naturally darken your skin. Along with blueberry skin benefits, they have also been shown to heal macular degeneration and improve vision. Raspberry – Rich in vitamin C, manganese and phytonutrients, especially rheosmin (raspberry ketone) giving raspberries the potential to improve weight management and obesity. By increasing enzyme activity, oxygen consumption, and heat production in certain types of fat cells, raspberry phytonutrients like rheosmin may be able to decrease risk of obesity as well as risk of fatty liver. Raspberry phytonutrients have been shown to play an important role in lowering oxidative stress, reducing inflammation, and thereby altering the development or reproduction of cancer cells. By helping to scavenge free radical molecules, and by helping to regulate the activity of enzymes that could trigger unwanted inflammation, the phytonutrients in raspberries help lower our risk of chronic diseases that are associated with chronic oxidative stress and chronic inflammation. Cranberry – A good source of vitamin C, Fibre and Vitamin E with high amounts of phenolic flavonoid phytochemicals giving cranberries potential health benefits against cancer, ageing and neurological diseases, inflammation, diabetes, and bacterial infections. Antioxidant compounds help prevent cardiovascular disease by assisting the body to lower LDL (bad) cholesterol levels, increase HDL (good) cholesterol levels in the blood and counteract cholesterol forming plaque formation in the heart and blood vessels. Offers protection against gram-negative bacterial infections by inhibiting bacterial-attachment to the bladder and urethra. Tibetan Goji Berry – These ancients berries contain high amounts of vitamin C, vitamin B2, vitamin A, iron, selenium and other antioxidants particularly polysaccharides with a strong oxygen radical absorbance cpacity (ORAC) value. This amazing little superfruit also contains natural anti-inflammatory, anti-bacterial and anti-fungal compounds. Their powerful antioxidant properties and polysaccharides help to boost the immune system and are renowned for benefiting the meridians, increasing Qi energy, strength and longevity. Goji berries are loaded with beta-carotene which helps promote healthy skin. Blackberry – The deep dark colour of blackberries mean it is one of the richest whole food sources of bioflavonoids and vitamin C, working to help lower the risk of a number of cancers. Consumption promotes tightening of tissues which in conjunction with their rich antioxidant profile help battle ageing and is great alternative to cosmetic surgery or procedures to achieve younger looking skin. Support prolonged mental clarity and focus with a high tannin content to reduce intestinal inflammation, alleviate haemorrhoids ad soothe diarrhoea. High in vitamin K for a muscle relaxant, helping to regulate menstruation and effectively help blood to clot. Beetroot – a natural sweetener with a low GI and high in soluble fibre. Soluble fibre is known to be helpful in developing and maintaining healthy intestinal flora and reducing high blood cholesterol levels. Naturally rich source of valuable minerals iron, potassium, manganese, magnesium, vitamins A, B’s, C, including B9 folate for healthy cell formation and protection against free radicals. Beetroot contains phytonutrients such as silica for healthy skin, hair, nails and improved calcium uptake, flavonoids and carotenoids helpful in reducing LDL cholesterols and betaine which are valuable in reducing accumulation of fats in the liver. Beetroot boosts stamina and can help to maintain energy levels when exercising for longer. 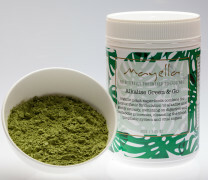 Contains certified organic* ingredients and fair trade, wild harvested ingredients. Vegan with no chemical, animal, GMO products, bulking agents or additives used. All ingredients are sourced from the global village and are the highest available quality while ethically and sustainably supporting local independent farmers under fair trade practices. All berries (exc. acai and goji berries) are derived from Australia and the USA with strict quality control and regulations. Nutritional summary for this product coming soon.